Diptera.info - Discussion Forum: Xanthogramma citrofasciatum? i think so, at least amalia_raluca put this ID on some fly from yesterday. she will check this later. In a word - yes. Nice find. Yep. Xanthogrammas are among my favourite flies. Sooo brightly coloured, yet somehow elegant. Rare enough to be noteworthy, but common enough to be seen every year. Perfect! According to available keys your ID is o.k. But citrofasciatum is actually a pair of two very similar species in Europe (publication in prep.). So it would be wise to keep vouchers. Hmm. So citrofasciatum will be split too? We've just this year learned that the Finnish material of X. pedissequum includes also X. stackelbergi. The latter is less common than pedissequum, but apparently not that rare in the southern and eastern parts of Finland. From our point of view X. citrofasciatum is a rare species, few currently active finnish dipterists have ever seen it outside museum collections. Just when you think you have an 'easy' species ... really obvious and not a problem to identify ... a splitter divides it into 2 species that are impossible to seperate without genitalia or DNA work!! citrofasciatum and pedisequum were nice and easy. Ban the Splitters!!! I can understand that many people prefer to have a lot of species that are easy to identify and indeed there are many insects which can be named from a foto. Unfortunately, it's a fairytale that syrphids are an easy group. For those of you who think splitters should be banned I want to mention that the result of splitting often makes much sense. E.g., splitting Cheilosia ranunculi from albitarsis results in two species with narrower ecological requirements. I'm happy about this. Further, it isn't really difficult to distinguish at least the male of these species. The same applies to Leucozona lucorum and inopinata which are separable evne with the naked eye. 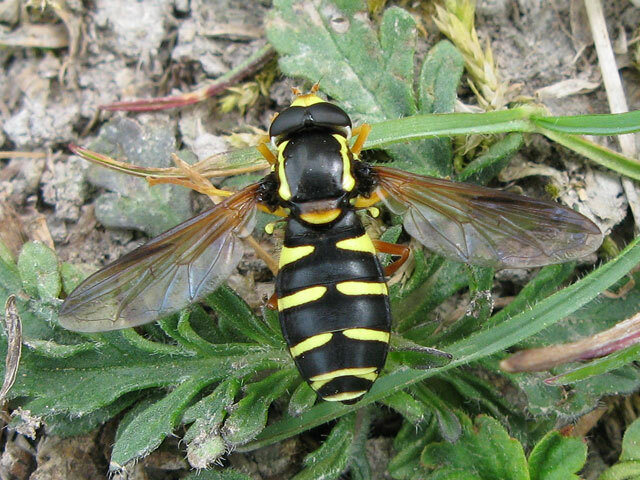 Syrphids are not a fine group for people who don't want to kill insects because then the majority of specimens cannot be reliably identified to species. To split or not to split, that's the question - to paraphrase an overburdened expression. My question is: on what grounds is the splitting done? It surely is a sign of my total ignorance, but I wonder what species criterion is used. Since it seems to me very difficult to establish whether two 'forms' cross in the wild, I guess splitting is much based on morphological criteria - especially those of the genitalia. But morphological differences in the genitalia need not make copulation impossible - and thus genetic isolation may not coincide with morphological differentiation. If a morphological difference is found, is then subsequently looked for a actual mating barrier in the field? If not, I would hesitate to attach species status to the morph. Currently, the species level is much inflated - at least this is so in butterflies. Here, all kind of bona fide subspecies are rased to specieshood, a prime example of rank inflation. In fact, one wonders whether the species concept itself is undergoing some major change! A reply to all the points of your posting would grow rather long. I agree that part of the inflation in species level taxa is nonsense. Many people don't have a well founded species concept and take morphological differences (that are often an artefact from too small samples) as evidence that distinct species are involved. But the fact that some taxonomists do bad work should not result in a condemnation of all "splitters". Of course I don't want to give here the information that will be used in my forthcoming paper on the citrofasciatum complex. However, the critics mentioned above do not apply. This split is not based on differences in genitalia nor in a difference in a single character or something like that. There is a whole set of differences, though all of them are not very striking, and - at least in SW Germany - there is a clear difference in the flight period and the sites where they occur. So, again, in my opinion the taxonomic split makes sense ecologically. I think the comment about 'splitters' was made more in fun than as a serious comment If there is a good reason for splitting, based on stable morphological features and this is backed up, like you said by distribution or flight-period differences then I don't think anyone would have a problem with that. Perhaps we should be annoyed with nature for being so diverse! Without giving too much away (I don't want to preempt your paper) can you tell us what kind of features split the 2 species? Will it be easy to construct a key? How much material have you examined and over what kind of range of distribution? Yes, this is to confirm that my comment was made absolutely in fun . I don't really have a problem with splitters, although sometimes I wonder how anyone decides there is more than one species involved! For example the Chrysis ignita group in the Hymenoptera: Chrysididae - they virtually defy identification! Looking forward to Dieter's paper on Xanthogramma, even though it will mean more work identifying hoverflies, which as Dieter says are not an easy family, but are tremendous fun! Incidentally I found some Cheilosia ranunculi yesterday in dry grassland, just as the ecological split would predict. o.k., then I took it too serious. That probably resulted from the very frequent complaints that people like me make working on hoverflies more on more difficult. To Chris: I think it wouldn't make sense to give here characters without precise illustration and notes on variation. There are few characters that are reliable and many in which there is a good statistical difference between these two species (similar to the situation in Leucozona lucorum/inopinata). Altogether, the identification of the species involved in "citrofasciatum" will be clear and much easier than in the pedissequum complex which is really difficult. It's reassuring to know that the characters are going to be clear. In which journal will you be publishing the paper? Wow, nice things going on then! I'm also looking forward to the publication of the paper! Dieter, is there also a paper coming on the presumed pedissequum complex? In Holland we have done some research and until now most people are not really convinced there are more species, at least not in northern europe. I know in Germany one talks about dives, marginale and indeed stackelbergi, but are there official publications of those already? Sorry Andy, I wanted to comment on your post but I couldn't resist in saying some more! Thanks for the correction. I am not feeling very well at the moment and I made a mistake.